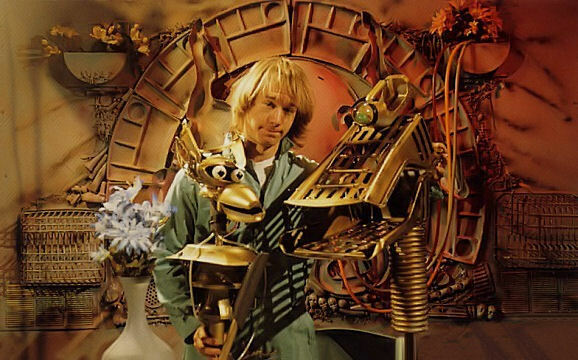 KTMA Joel Hodgson, Crow T. Robot and Gypsy. During the first run of Mystery Science Theater 3000, the show aired on TV23 KTMA in Minneapolis and St. Paul, Minnesota (preceding the first official season which was broadcast nationally on the Comedy Channel, later to become Comedy Central) from 1988-1989. For nearly 30 years, episodes 1 and 2 of the KTMA season were thought to be forever lost until the master tapes were rediscovered in 2016 and released by series creator Joel Hodgson through the MST3K Revival Kickstarter. The 3rd episode, featuring "Star Force: Fugitive Alien II", is now the only one missing from the fan's circulation of recordings. Over the years, fans have primarily relied on home recordings of the shows original 10 season run (1989-1999). The shows creators had even encouraged a word of mouth campaign in it's early seasons with the phrase "Keep Circulating the Tapes" appearing at the end of an episodes credits, thus leading to a tape trading community in the days before most episodes were available on home video (official releases, beginning in 1996 with Rhino Home Video and moving to Shout! Factory in 2008, have been released at a fairly slow rate due to movie copyright and licensing negotiations). However, since the initial KTMA series was new and strictly limited to the Minneapolis area, only a small handful of viewers could have possibly recorded these episodes. When originally aired, the first three episodes seem to have not been re-run after their initial premieres, apart from a repeat later in the same night. Also often considered a lost episode by the MST3K fanbase is the original pilot, featuring "The Green Slime", however, this is simply a 15-minute test pilot used to pitch the series to KTMA and was never truly aired. It has since shown up in bootleg form on sites like YouTube. Though the master tapes aren't truly "lost", (they were held by producer and Best Brains co-founder Jim Mallon, having since transferred to Joel Hodgson and Shout! Factory), Best Brains Productions have made their disdain for the KTMA season open, although their attitudes have seemed to soften with the acquisition of the DVD rights by Shout! Factory, the company having made a huge push towards increasing the extras on their MST3K releases. Many of the missing KTMA episode host segments could once be viewed on the Best Brains website. Along with that, many host segments from these episodes can be seen on the "MST Scrapbook" VHS tape released by Best Brains in 1995 as a video diary of the series' progression. The movie featured in the missing episode, "Star Force: Fugitive Alien II", was revisited in the third season of MST3K, along with many other KTMA riffed movies. The 15 minute "The Green Slime" pilot was aired for fans by Best Brains at the Archon 32 Convention in St. Louis on October 3, 2008. As previously mentioned, various quality recordings by fans in the audience have popped up on YouTube. Unfortunately, the quality leaves much to be desired, the laughter of the audience also covers the audio in places. I see no reason to look at the KTMA episodes other than for academic reasons. It was profoundly important for the development of movie riffing, but they are hard to watch now if you ask me." Not too long after the session, episodes 1 and 2 of the KTMA era episodes were released via Joel Hodgson's MST3K Kickstarter. However, in regards to K03, around the same time, Shout! Factory planned to release a limited edition bonus disc for MST3k Volume 38 with the surviving KTMA host segments (which was later canceled due to poor quality master tapes), indicating some episodes may have been lost or destroyed. Being that K03 was not released with the first two, it gives the unfortunate possibility that K03 may have been one of them. While Jim Mallon uploaded clips from the episode on the (since revamped) mst3k.com website in 2009, it is possible something may have happened to the only known copy of the tape between 2009 and 2016 and it may very well be lost forever. HD camera recording of the original pilot, "The Green Slime", at Archon Convention in 2008. ↑ Known information on the missing episodes. Retrieved 27 Aug '13. ↑ MST3K official site with KTMA clips (under Genesis tab). Retrieved 27 Aug '13. ↑ Hodgson Reddit Q&A Retrieved Nov 27 '13.